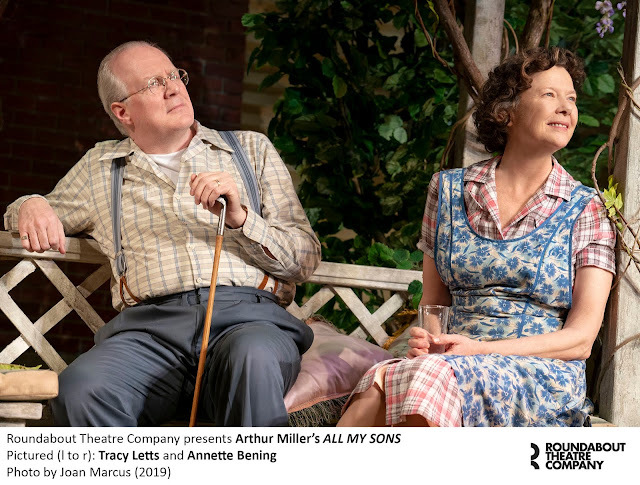 The third Broadway revival (after those of 1987 and 2008) of Arthur Miller’s 1947 All My Sons, directed by Jack O’Brien for the Roundabout Theatre Company, is moderately effective, with strong histrionics from its three leads, but never fully rises to the occasion. 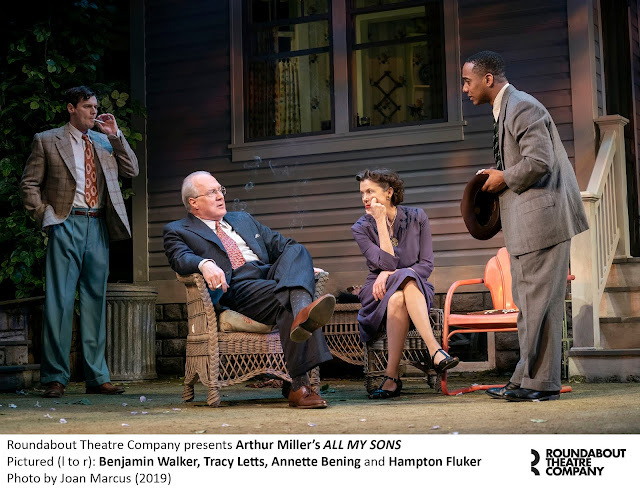 Miller’s play resonates with contemporary relevance (think capitalistic excess, faulty airplane issues, and “exoneration”) but, at least in this version, seems more dated, wordy, and melodramatically contrived than ever. And then there’s that darned casting controversy. 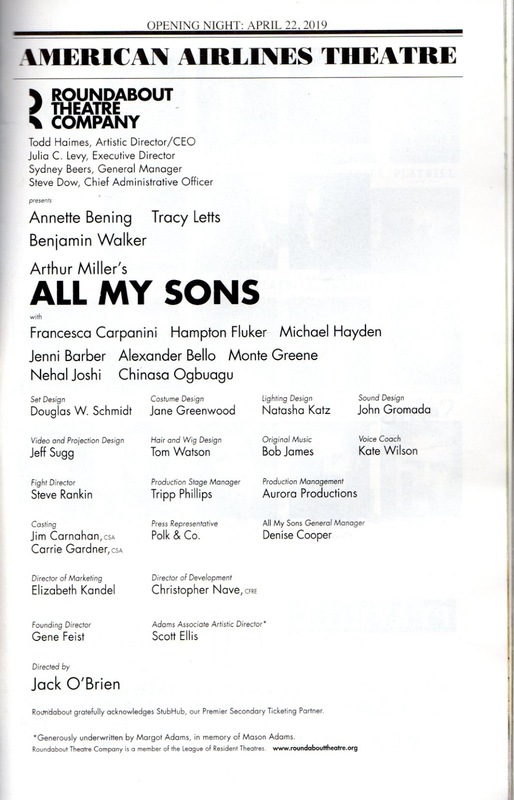 For those unfamiliar with it, All My Sons takes place in 1947 in small-town Ohio, and is not at all concerned with racial issues. 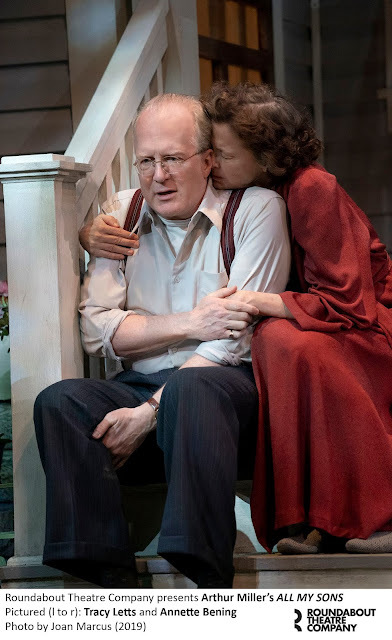 Its tale of the corruption of the American dream by capitalist greed focuses on the Keller family, Joe (Tracy Letts, Who's Afraid of Virginia Woolf? 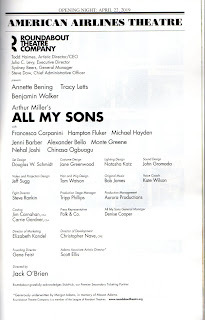 ), who owns a manufacturing plant; his wife, Kate (Annette Bening, Coastal Disturbances); and their son, Chris (Benjamin Walker, American Psycho). Another son, Larry, was killed during World War II. Much of the plot concerns the relationship between the Kellers and the Deevers. 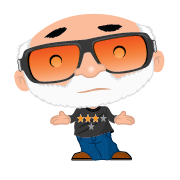 Steve Deever, Joe’s partner, took the rap for the defective airplane parts produced by his and Joe’s company, which led to the deaths of 21 men. Mosher quit, O’Brien was hired, and, in a twist even weirder than Mosher’s plan, an African-American actress, Chinasa Ogbuagu, was hired to play Sue Bayliss, wife of the Kellers’ neighbor, Dr. Jim Bayliss (Michael Hayden). Moreover, the white Ann’s brother, George, was cast with the African-American Fluker (just nominated for a Drama Desk Award as Best Supporting Actor in a Play). 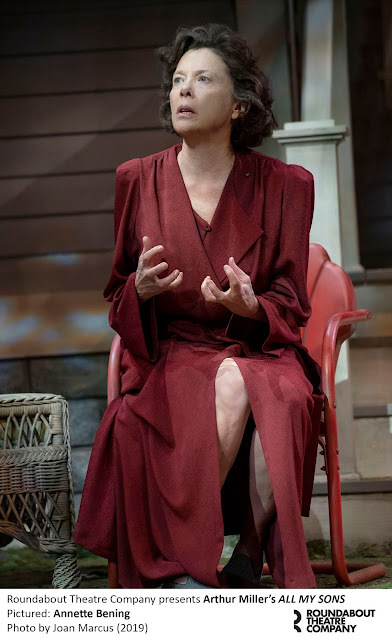 This production has gone mega in its attention to realistic detail, with period-authentic costumes, down to the women’s seamed stockings, by Jane Greenwood and an ultrarealistic outdoor setting by Doug Schmidt (beautifully lit by Natasha Katz) showing the rear of the Kellers’ home, its backyard, and the back of an adjoining house. It’s the kind of set you may find yourself inspecting for telltale hints of artificiality, like the material used to create the grass lawn. In other words, its visual foundation is illusionistic, seeking, like a movie, to be as close to reality as possible. So, regardless of where you are on the racial spectrum, and what you may think of colorblind casting, you can’t be blind to Sue’s race when she enters. When you should be attending to the dialogue, you are instead spinning rationales for why everyone takes for granted that a black woman is married to a white doctor in suburban Ohio in 1947. Sue’s role is small so you soon ignore it. However, you’re going to be taken even further aback when George, whose role is much more substantial, enters. This is too big an issue, with too many qualifications, to elaborate on here, but my own position is that colorblind casting must be used within reason and not when it becomes a distraction that steals focus from what you should be watching and breaks whatever illusion a play is striving for. With a few exceptions (Denzel Washington in The Iceman Cometh, perhaps), what generally works in classic dramas and musicals doesn’t so easily pass inspection in straight plays set in particular, racially sensitive times and places. There’s still much power in Miller’s dialogue, especially when Bening, Letts, and Walker pull all the stops out in the third act. The emotional storm and stress reaches hurricane levels but, because the situations seem so carefully manufactured, including the last-minute revelations in a letter Ann produces, it fails to truly break your heart. Bening brings striking, almost neurotic intensity to her maternal’s refusal to accept that her son is dead. 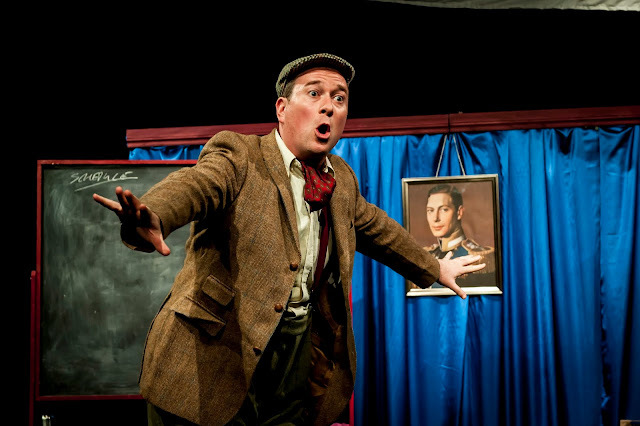 Letts offers a range of emotional expressiveness, from avuncular pal to guilt-ridden malefactor. And Walker’s acting palette allows him to be believably shy, romantic, idealistic, and volcanically angry. The following is an edited essay on the original 1947 production of All My Sons from my Encyclopedia of the New York Stage, 1940-1950. 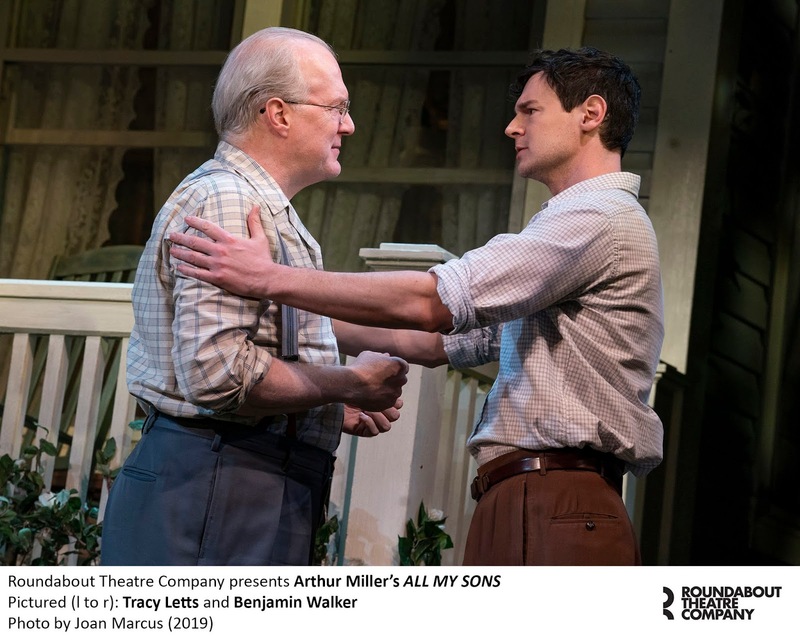 All My Sons Author: Arthur Miller; Director: Elia Kazan; Sets/Lighting: Mordecai Gorelik; Costumes: Paul Morrison; Producer: Harold Clurman, Elia Kazan, and Walter Fried i/a/w Herbert H. Harris; Theatre: Coronet Theatre; opening, January 29, 1947; performances: 328. 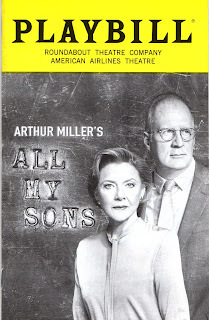 This bombshell of a thesis drama represented Arthur Miller’s first success. He was immediately heralded as a great white hope of the American theatre by some, while others had serious reservations. 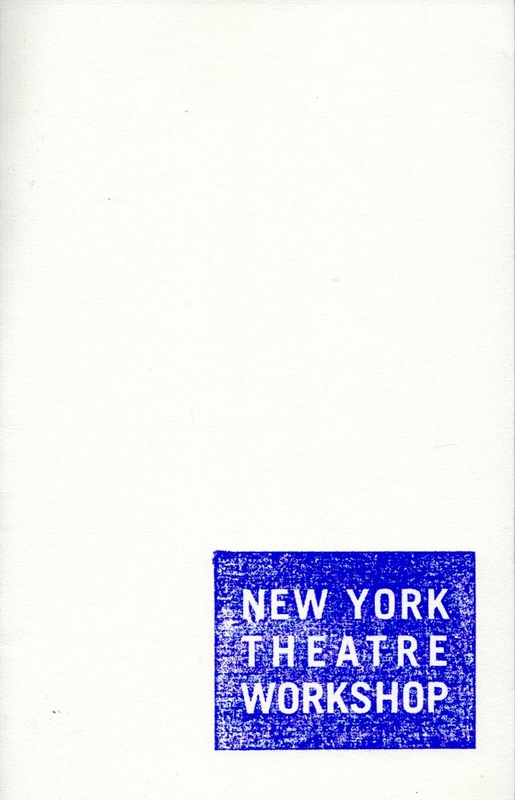 It was selected as the best American play of the season by the Drama Critics Circle and was one of Burns Mantle’s Ten Best. Miller was inspired to write his play when learned during the war of the true story of a war profiteer’s daughter who, despite her love for her father, had exposed him and then left home. Its original title had been The Sign of the Archer. Set in the backyard of the Keller home in a small, Ohio town and transpiring on a single Sunday, it pictures the Keller family of Joe (Ed Begley), son Chris (Arthur Kennedy), and mother Kate (Beth Merrill). Larry, another son, has died in the war, although Kate finds this hard to accept and keeps believing that he is alive. Chris, a former army captain now in business with Joe, is in love with Larry’s bereaved fiancée, Ann Deever (Lois Wheeler), but Kate opposes the match. 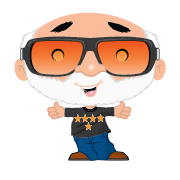 It soon develops that Joe may have escaped imprisonment for the manufacture and sale to the air force of defective airplane cylinders, a crime that led to the deaths of 21 flyers. Joe’s betrayed partner, Steve—Ann’s father—took the rap for the deed and went to jail. When the truth—revealed in Larry’s last letter to Ann—comes out, Joe claims not only that he had placed loyalty to his family—for whom he had to provide a living—ahead of patriotism but that he was driven by the profit motive. The idealistic Chris—previously convinced of Joe’s innocence—confronts him in horror at the revelation. Joe discovers that Larry, racked by guilt when he learned of his father’s complicity, killed himself. Joe realizes that “in sinning against other men’s sons, he has sinned against his own,” as Euphemia Van Rensselaer Wyatt put it in Catholic World, and deals with his moral irresponsibility by shooting himself. But George Jean Nathan, in the New York Journal American, was unimpressed, believing the theme familiar and the treatment equally conventional. “It seems to me to be just another in the line of exhibits which misses out because it says what we already all too well know in a manner we already know as well, and in terms and language that are undistinguished.” Howard Barnes in the Herald Tribune reported that Miller “has an acute feeling for theater and a certain sense of form, but he has not blended them in a satisfactory drama.” He felt the characters were more like puppets than self-motivated personages and that much of the action was contrived. The production itself was lauded by most for its pulsing direction and vividly intelligent and emotional acting, especially that of Merrill, Begley, and Kennedy. 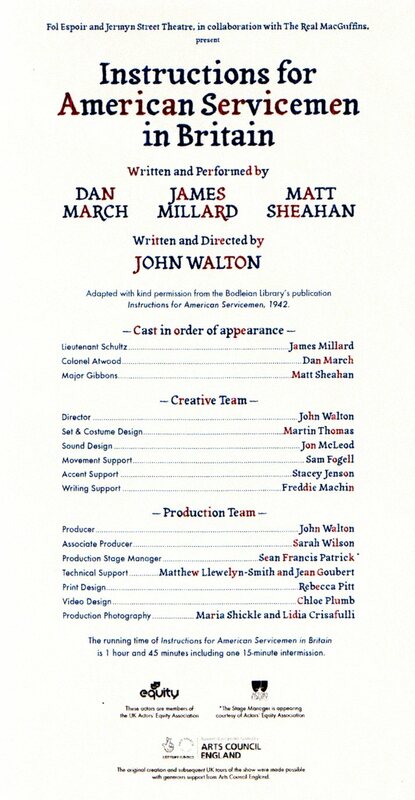 Expert work also came from Karl Malden (as George Deever), John McGovern, Peggy Meredith, and Eugene Steiner. According to Kazan’s Elia Kazan: A Life, coproducer Clurman himself had wanted to direct the play and was very upset when Miller chose Kazan. This led to what Kazan called abominable behavior by Clurman at rehearsals. “His discipline . . . was that of a naughty child.” Clurman would sit with a secretary, presumably giving notes, but laughing and talking loud enough for others to hear, or would be dallying sexually with another woman at his side. In these and other ways he made his presence unbearable for Kazan. Clurman also kept insisting to Kazan that the character of Mrs. Keller be made responsible for part of Keller’s guilt, although Kazan resisted these suggestions. Kazan said Miller was influenced by them and tried rewriting the part, only to give up the attempt. However, in Timebends, Miller’s autobiography, the playwright disclosed his believe that Mrs. Keller definitely shares her husband’s guilt. 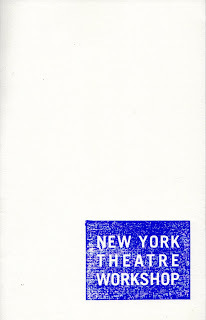 That year was the first for the Tony Awards, and Kazan won as best director. 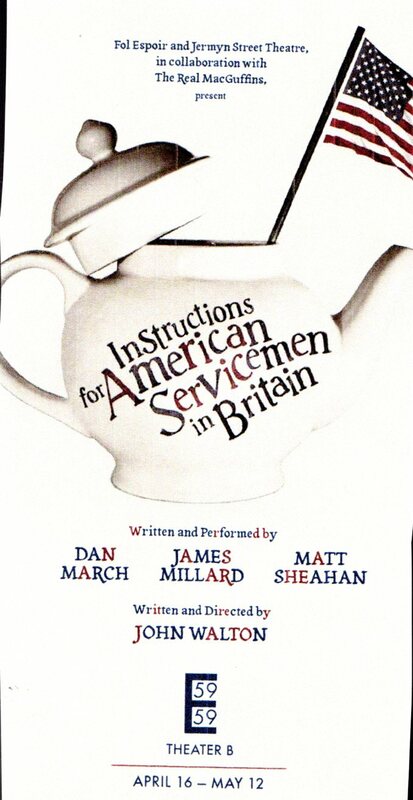 "A Spot of Tea; A Cup of Joe"
My subway trip from South Queens to 59E59 Theaters, where I was heading to see Instructions for American Servicemen in Britain, had been distressing. The last thing I needed was a show that would only make the evening a total disaster. (Reader: it didn’t.) I arrived late because I’d been stuck on the A train in Brooklyn after someone had jumped or fallen in front of the one before mine. Matt Sheahan, Dan March, Photo: Lidia Crusafulli. Without going into too much detail, let me simply say that, after a long delay, everyone on my train, which had inched to within a foot of the one still parked halfway through the station, was asked to march from car to car before entering the forward train, and then walk through several more cars until being able to exit onto the platform. Dan March. Photo: Lidia Crusafulli. I’d left home at 5:45, it was now 6:45, curtain time was 7:15, I was at Nostrand Avenue, and getting to 59th Street between Park and Madison was going to be a close call. I chanced it via the local and the F, and, after even more adventures, got to the theatre around 7:25. The show had begun a couple of minutes before but I was let in through a latecomers’ entrance. As I wiped my brow and caught my breath, I was quickly delighted at the antics of the show’s three gifted British comic actors, who had brought the show from London as part of 59E59’s annual Brits Off Broadway festival. Matt Sheahan, Dan March. Photo: Lidia Crusafulli. When it was over, my plus-one (whom the staff had graciously allowed to take her seat when she learned I’d be late) said her cheeks were still sore because she’d laughed so much. My own cheeks were okay but my knees were a bit shaky following an audience participation sequence late in the show when everyone in the house is asked to rise. I needn’t remind you of the age and hair color—when hair exists—of a typical New York theatregoer. Then, as Glenn Miller’s “In the Mood” blasts away, the crowd, standing in front of its seats on the wooden bleachers, stamps in rhythm, jumps up and down, circles in place, and waves the hankies it’s been given as it executes a Morris Dance they’ve just been taught. Think a British Hokey Pokey and you’ll get the idea. James Millard, Dan March. Photo: Lidia Crusafulli. While I could have done without the dancing, the rest of the show proved quite amusing, like a sort of prolonged, Monty Python-meets-"Saturday Night Live" farcical sketch. It’s inspired, of all things, by a pamphlet published in 1942 by the Bodleian Library as Instructions for American Servicemen. The pamphlet was written for American servicemen in England during World War II to teach about the social, climatic, and linguistic peculiarities of their host country, as well as to help neutralize Nazi propaganda designed to create disunity among the two nations. Judging by this show, the Englishmen and Americans didn’t need the Germans to make them behave toward each other like mad dogs in the midday sun. The other is the more positively appealing, average Joe, Lt. Schultz (James Millard), in leather bomber jacket, who serves to smooth over Atwood’s more assinine behavior. 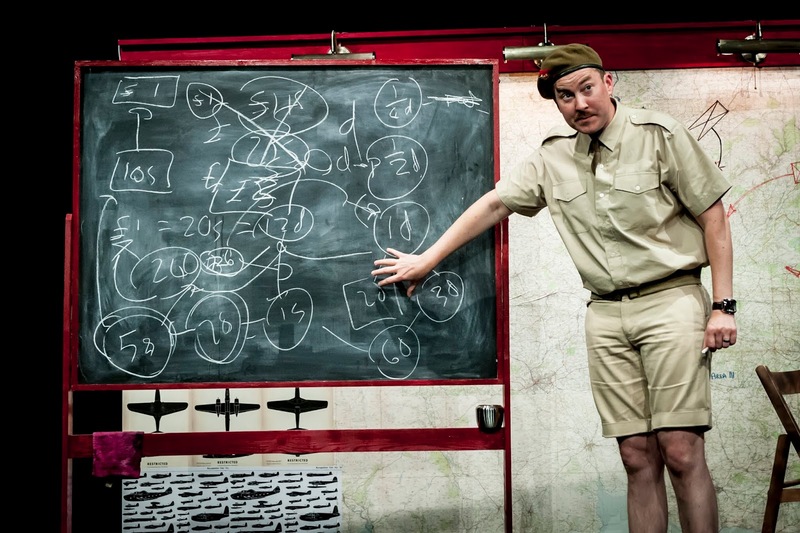 Assisting them is the prim and proper, coin-collecting Brit, Maj. Gibbons (Matt Sheahan), informally garbed in tan military shirt, shorts, and cross-gartered socks (because his other uniform is in the laundry). 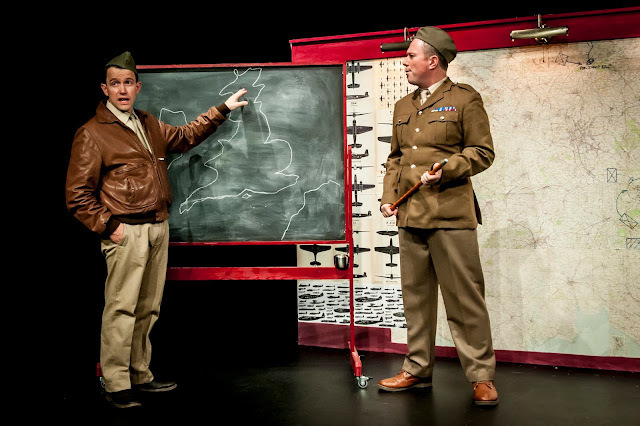 The setting, by Martin Thomas (who also did the costumes), is mostly bare, using only a few significant props, especially a two-sided blackboard. All is being done in preparation for the expected arrival at 16:00 of Prime Minister Winston Churchill. Meanwhile, concern is expressed for a cat named Mr. Pippin belonging to the local vicar. Matt Sheahan. Photo: Lidia Crusafulli. 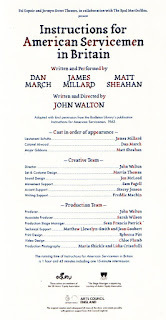 Instructions is essentially a sequence of rapid-fire sketches that allow the actors to play not just their principal characters but, with wigs and costume changes, several others as well. 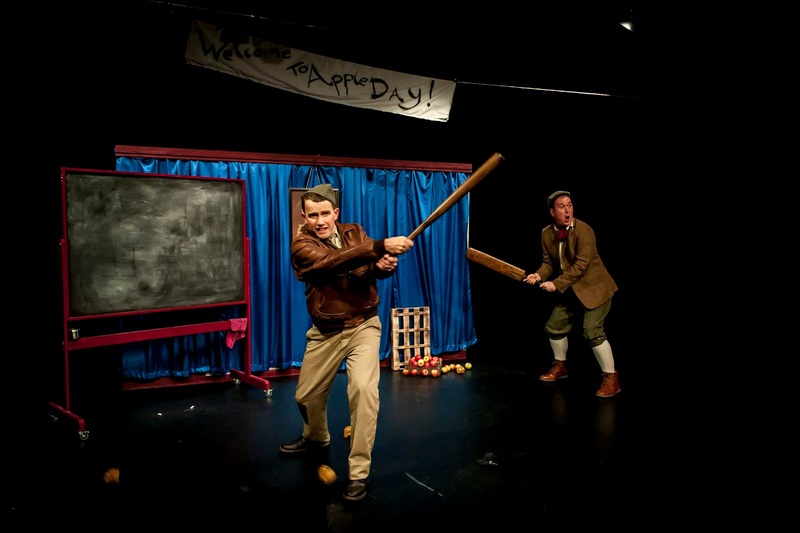 It show their considerably versatile skills at physical humor, mugging, accents (American as well as various British ones), and timing. Even the insertions of broadly obvious cross-dressing is done with music hall perfection. James Millard, Dan March. Photo: Lidia Crusafulli,. There are too many standout bits to list but any American who’s ever been to Britain will appreciate the comic takes on the rainy weather, the pronunciation of city names, like Worcester (and its associated sauce), English food (wait till you see Atwood eat it), coffee and tea, the class system, cricket (which is contrasted with baseball), and money. The latter is explained in a brilliant routine using every inch of a blackboard in which Maj. Gibbons explains how “simple” is the British currency system of pounds, guineas, pence, shillings, farthings, and pennies. 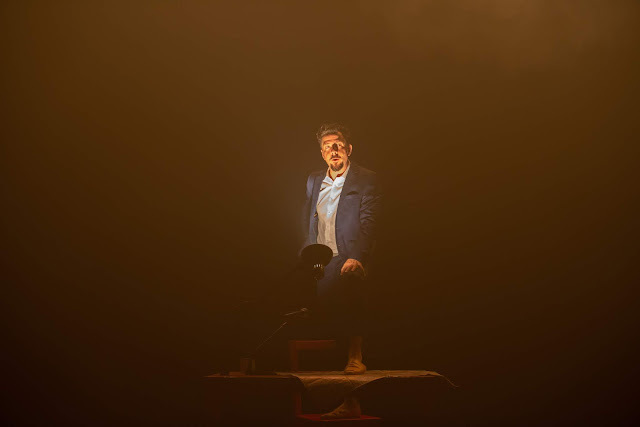 A German-accent segment about Nazi spies in England, performed with the actors’ Hitlerian heads attached to Nazi puppet bodies, is also memorable. Two hours and 10 minutes (including an intermission) is generally far too long for a slender show like this, and is probably its biggest drawback. 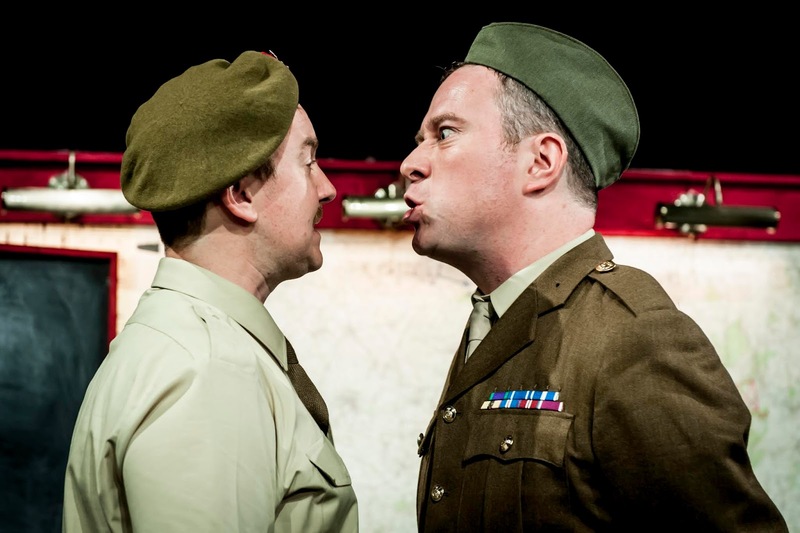 Yet the actors never run out of steam as they find one way after the other to good-humoredly skewer the more egregiously stereotypical characteristics of both stiff British upper-lips and brash Yankee arrogance. Wait, did that chimpanzee just get baptized? Wait, did that chimpanzee just do the ‘happy baby’ yoga pose? Wait, did that chimpanzee just accidentally pleasure herself with the hose of a vacuum cleaner? 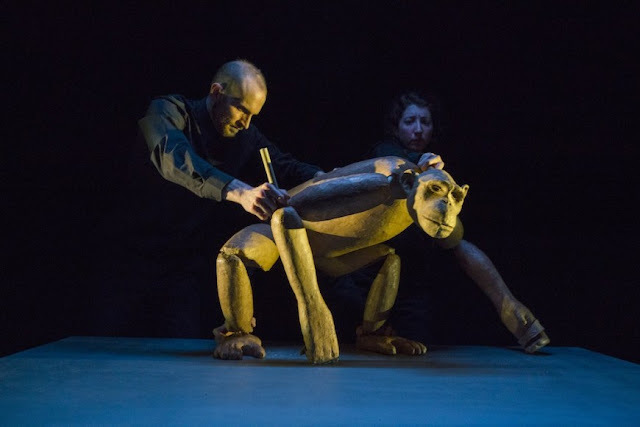 Watching this chimpanzee’s antics on stage at the HERE Arts Center, it’s easy to forget she’s a wooden puppet. “Wooden” is often a derogatory word used to describe an actor whose face doesn’t move. But in Nick Lehane’s Chimpanzee, the titular simian is bursting with animation, charm, and even a bit of cheekiness. Even though her face doesn’t move. Magnificently crafted by Lehane and expertly manipulated by three puppeteers, Rowan Magee, Andy Manjuck, and Emma Wiseman, this adorable ape will make a believer out of anyone who might have thought puppetry was just kid stuff. 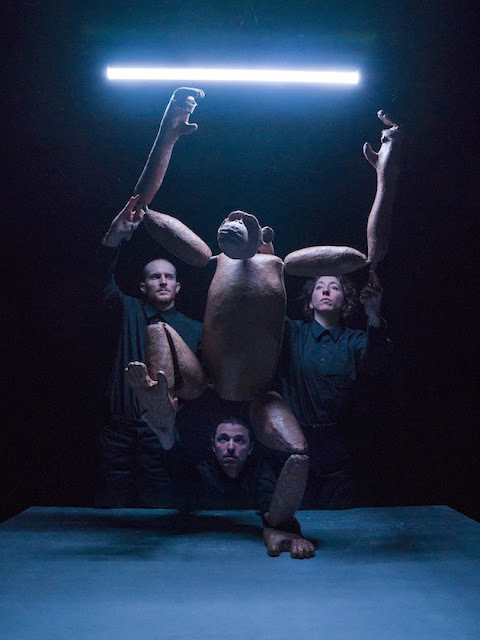 Presented by HERE’s Dream Music Puppetry Program, the hour-long nonverbal narrative is presented in short vignettes alternating between the aging chimp’s captivity in a biomedical lab and her memories of a happier life being raised in a home where humans lovingly tucked her into bed. So engaging is the childlike chimp that she holds our attention performing mundane everyday activities, like pouring a cup of tea or taking a bath. The Chimpanzee. Photo: Richard Termine. In a particularly moving scene, she rubs the bald head of a baby doll and touches her own head in a moment of discovery. 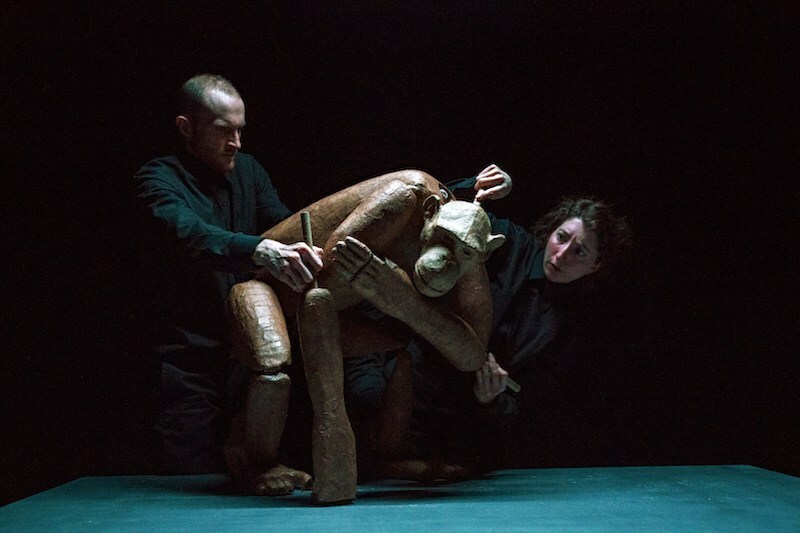 The puppet’s face doesn’t move, so why does it feel as though she has physically transformed? This is the marvel of puppetry done well. Based on true events, Chimpanzee recounts the lives of chimps raised as human children in human homes in a series of cross-fostering experiments conducted in the United States. When funding dried up, or when the chimps became too mature, many went on to live as test subjects in biomedical facilities. With only a simple platform and minimal props to set the scenes, Kate Marvin’s excellent sound design is a key player here. When the chimp is in the lab, we hear throngs of other chimps in the distance and the nerve-wracking click-clacking of footsteps and jangling keys, a constant reminder that this chimp—and many others—are on lockdown in a too-small space. The contrasting joyful sounds of children playing and a dog barking in her memories are a welcome relief from the jarring, jail-like scenes. The life-sized chimpanzee puppet stands grand at full-length, making her listless demeanor all the more heartbreaking when she’s held in isolation. In the lab, she has little to do but sit idly in the fetal position, or helplessly bang the bars of her cage. 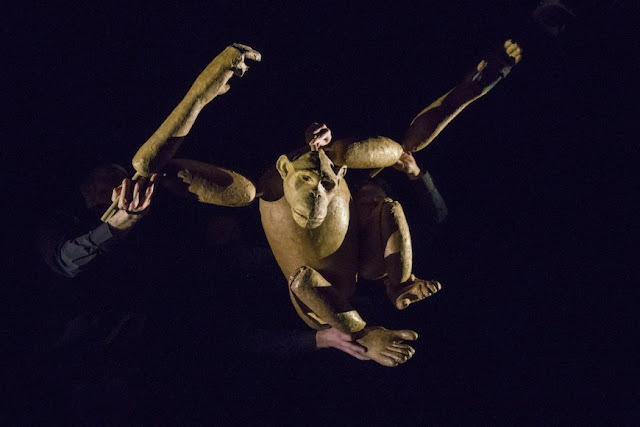 The puppeteers infused her with such sadness and rage, I could hear the audience’s stifled breathing. Hundreds of chimpanzees remain warehoused in labs today. 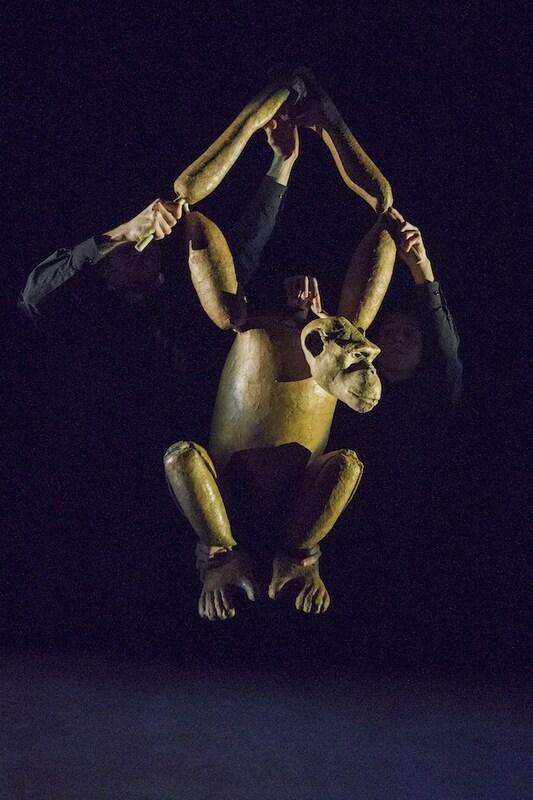 This production shows the boundless capabilities of these incredible mammals. But just because there’s evidence they can be raised in human homes, should they? Chimpanzee provides the audience more questions than answers in this thought-provoking piece that refuses to stop monkeying around in my head. 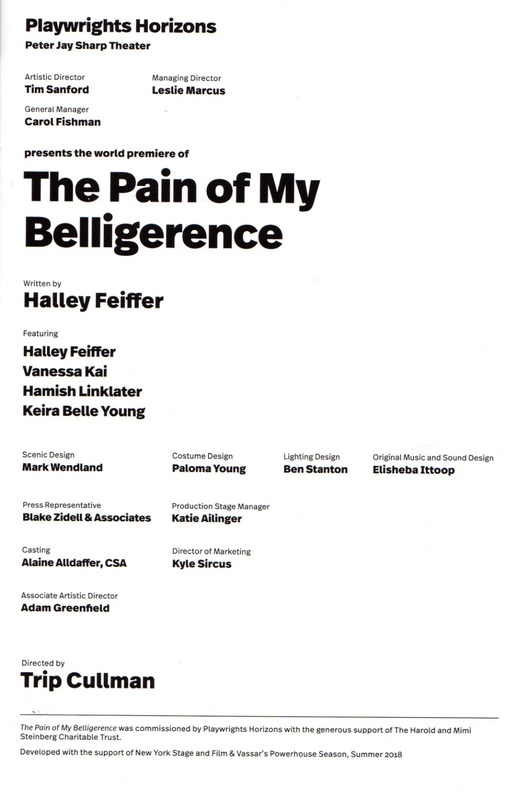 For my review of The Pain of My Belligerence please click on THEATER PIZZAZZ. 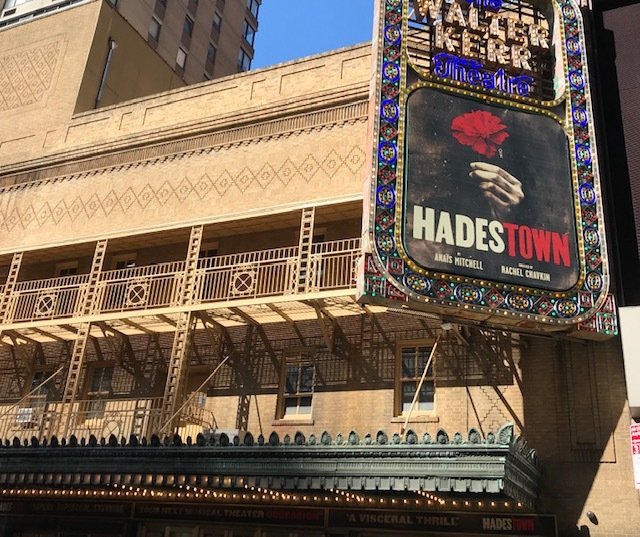 Be careful if you’re walking past the Walter Kerr Theatre on W. 48th Street during a performance of Hadestown. 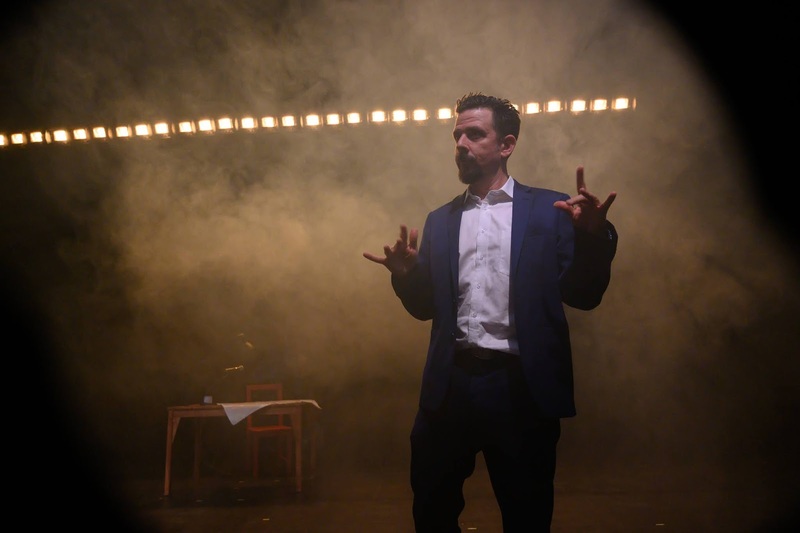 You may feel a blast of infernal musical theatre heat coming from inside, where this red-hot show has finally moved following its 2015 Off-Broadway debut at the New York Theatre Workshop, and productions in Edmonton, Canada, and London’s Royal National Theatre. And the subterranean rumbling you may hear isn’t from a nearby subway; it’s the basso-profundo voice of one of New York’s most commanding performers, Patrick Page, slick perfection itself in the role of Hades, King of the Underworld, in this tunefully delicious, theatrically tasty show. Andre de Shields. Photo: Matthew Murphy. I found its script dramatically “flavorless” in its earlier manifestation but my taste buds have matured since then. While not its strongest feature, Hadestown’s book now seems a fine wine accompaniment to a spellbindingly scrumptious theatrical feast. Hadestown is a mostly sung-through musical conflating the Greek myth of Hades and Persephone with that of Orpheus and Eurydice, and swirling about themes of power of music, love, and trust. It originated as a compilation of New Orleans-style jazz, folk, and blues tunes by folk singer-songwriter Anaïs Mitchell. 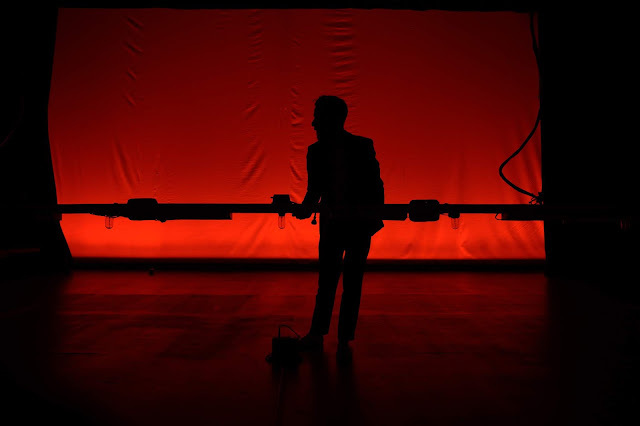 In 2010, after being performed at various Vermont venues it became an hour-long, concept album. 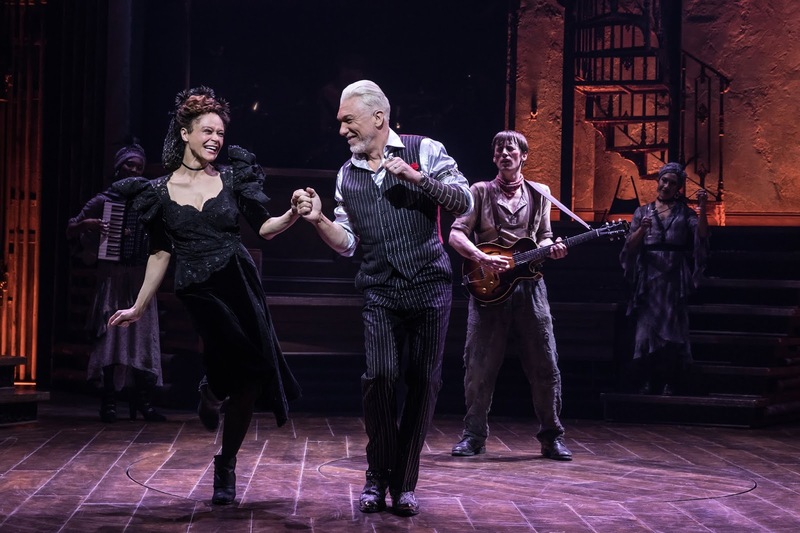 The album was then developed by Mitchell and the exciting young director Rachel Chavkin (Natasha, Pierre & the Great Comet of 1812) into Hadestown, which runs around two and a half hours. Each song is distinctive, and several are true show-stoppers.The 2015 production was shorter but felt longer; the audience at the Broadway version behaved like it wasn’t long enough. 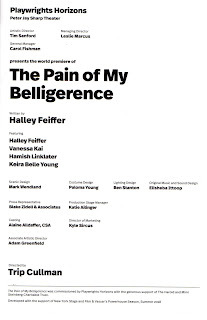 For the NYTW staging, set designer Rachel Hauck gutted the space to build a wooden arena with the orchestra slotted in at one point and the audience seated on uncomfortable old wooden chairs (unmoored cushions supplied). A huge, leafless tree that no one ever climbed towered in one corner. Eva Noblezada and the company of Hadestown. Photo: Matthew Murphy. Aided by lots of smoke, Bradley King’s flamboyant lighting, sometimes enhanced by small lanterns, sculpted the action in rock concert style, while actors in close proximity to the spectators created a mildly immersive ambience. For Broadway, the auditorium remains unchanged and Hauck’s new design places the show entirely within the proscenium, with an upstage curved wall suggesting New Orleans French Quarters architecture. In the middle rises a winding staircase, with ornate wrought iron railings, leading to a balcony fronting large double doors. Behind them is the dwelling of Hades, dictatorial ruler of Hadestown. The seven-member orchestra is dispersed along the wall at left, right, and center. Workers' chorus. Photo: Matthew Murphy. At center are three turntables, one inside the other, capable of running counter to one another. The central disk also serves as an elevator trap. 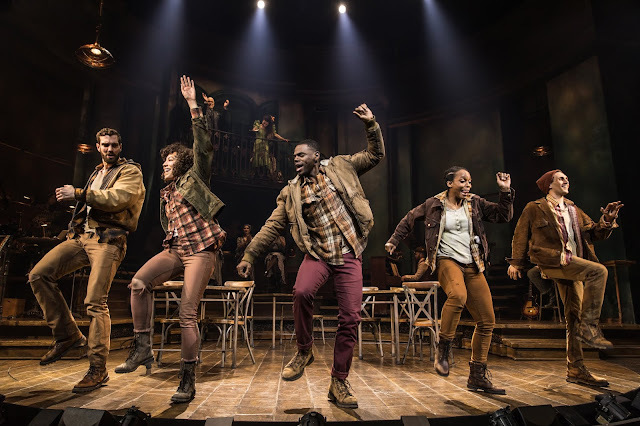 Chavkin’s staging, and David Neumann’s choreography, make abundant use of these mechanical aids with remarkably effective results, creating moving arrays of actors moving in different directions, left, right, around, up, and down. 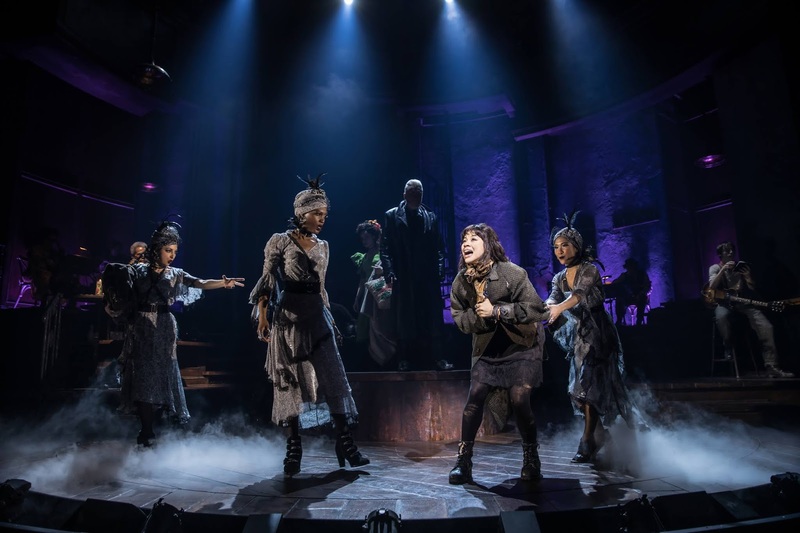 And King’s lighting, again making much use of smoke, outdoes itself in evoking mood-setting effects, including a sequence when about a half-dozen hanging metal lamps are choreographically incorporated into the action. 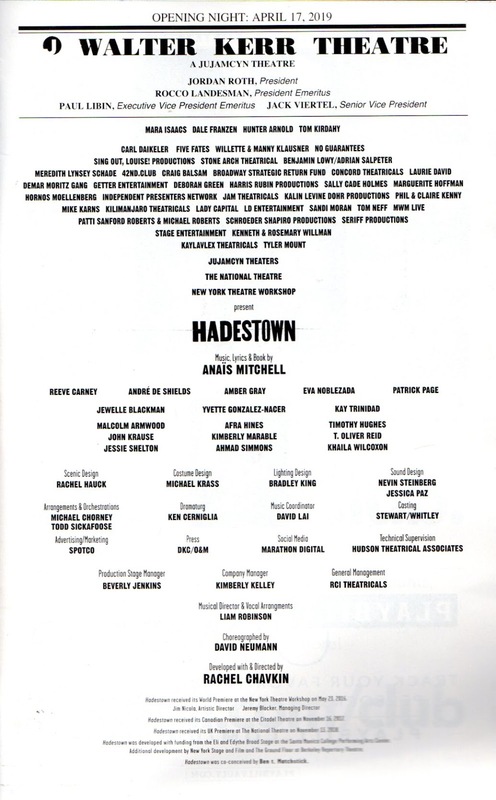 Reeve Carney and the company of Hadestown. Photo: Matthew Murphy. 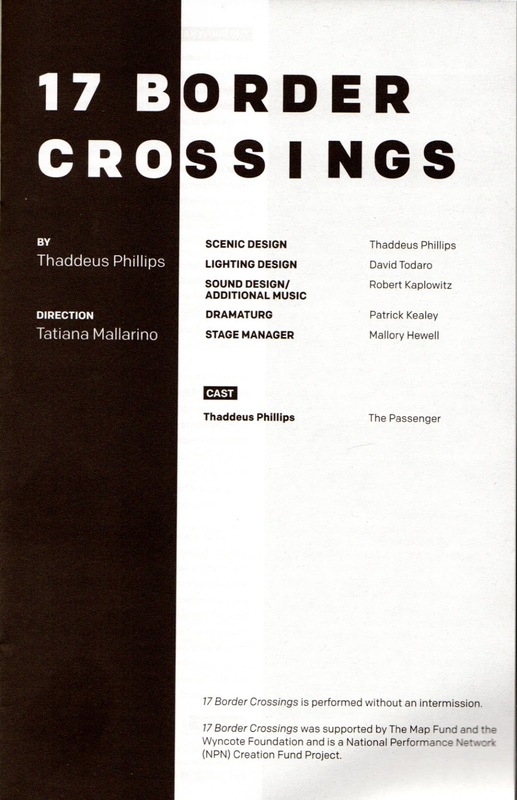 Of the original leads, only Patrick Page and Amber Gray return. Orpheus, first performed by Damon Daunno, presently playing Curly in the new revival of Oklahoma!, is taken by Reeve Carney (the original Peter Parker/Spider-Man in Spider-Man: Turn Off the Dark), a high tenor ranging into falsetto. 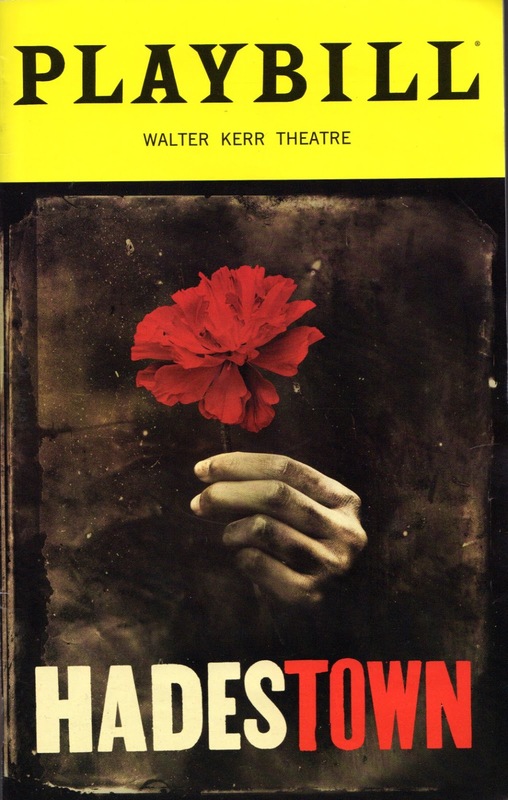 Euridice, taken Off-Broadway by the superb Nabiyeh Be, is now the responsibility of the equally talented Eva Noblezada (Miss Saigon). 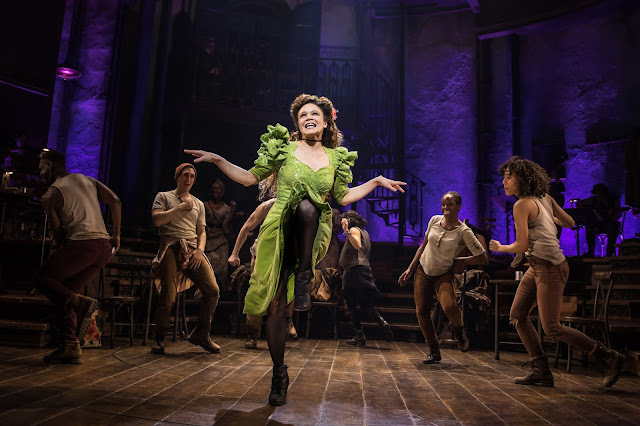 Amber Gray and the company of Hadestown. Photo: Matthew Murphy. The chorus-like Fates, mentioned below, are also new: Jewelle Blackman, Yvette Gonzalez-Nacer, and Kay Trinidad, taking the roles created by Lulu Fall, Shaina Taub, and Jessie Shelton. 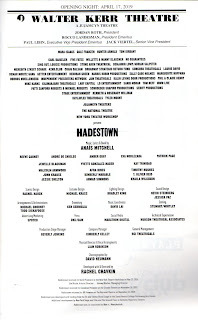 And Hermes, who serves as narrator, is Broadway veteran André de Shields instead of Chris Sullivan. Jewelle Blackman, Kay Trinidad, Yvette Gonzalez-Nacer. Photo: Matthew Murphy. 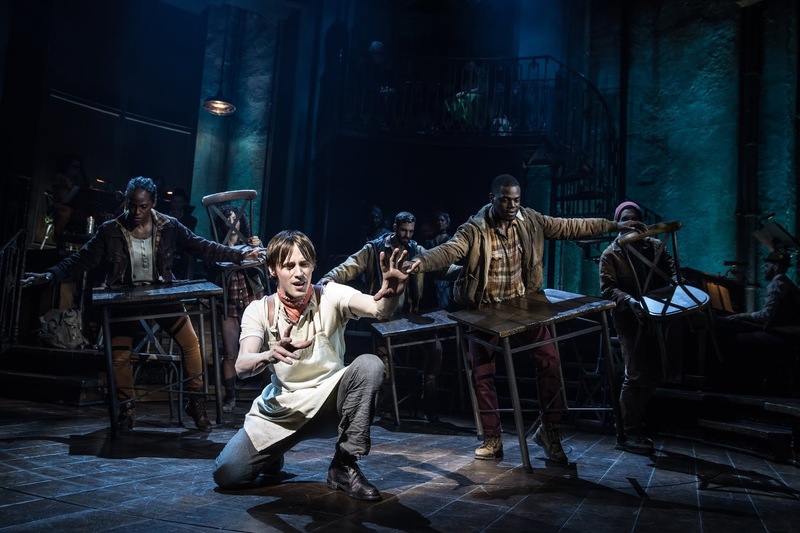 The show (whose plot summary can be found here) is principally concerned with the tragic, mythical romance of Orpheus, the gifted lyre musician (read: guitar), who descends to Hades to bring his lost-girl sweetheart, Eurydice, back to the world of the living. 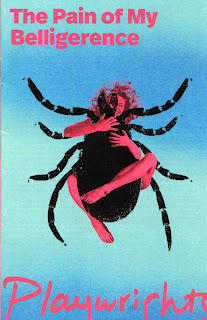 Only after hearing the finished version of the song Orpheus has been constantly working on (intended to bring the contentious world together) does Hades relent. He insists, however, that, if Orpheus looks back to see whether Eurydice is following him, she’ll have to stay in Hadestown forever. In 2015, I was disappointed that a show inspired by a tale dramatized in countless films, plays, and operas (from classical to rock) had squeezed so little drama from it, despite the uniformly appealing songs and the infusion of a capitalistic exploitation theme. Because the songs are mostly preoccupied with atmospherics and emotional responses, their lyrics only indirectly offer exposition, reveal character, or move the plot along. 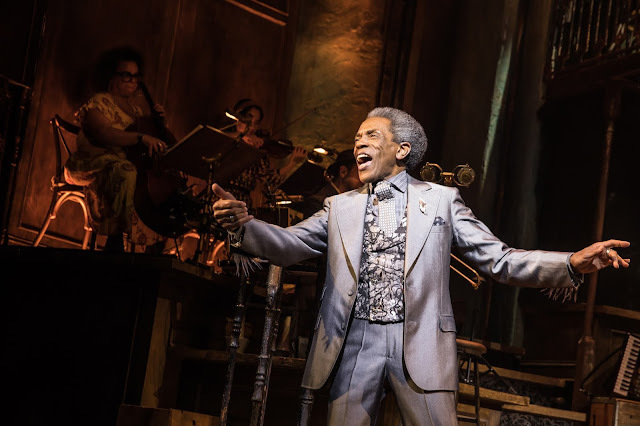 Eve Noblezada, Andre de Shields, Reeve Carney. Photo: Matthew Murphy. These factors seem secondary now; enough is revealed by Hermes’ narration to serve the story and characters. The latter, after all, are intended more as iconic figures than flesh and blood human beings, although we can’t help but become affected by them as superbly embodied by these warmly human actors. 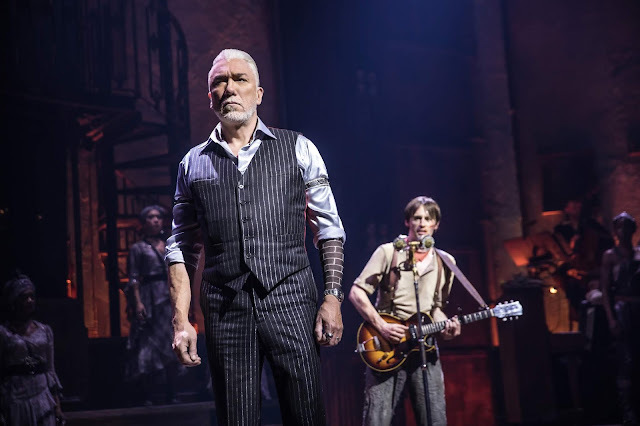 Patrick Page, Reeve Carney. Photo: Matthew Murphy. 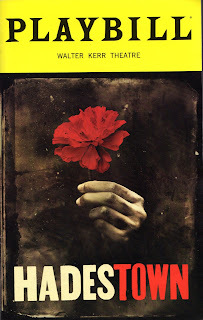 The basic myth remains intact although Eurydice, a runaway, goes to Hadestown (by train, it should be noted), not because she’s dead but as a personal choice, seeking to escape the hard times up on top where, the lyrics say, “the chips are down”; her road to Hell is paved with good intentions. 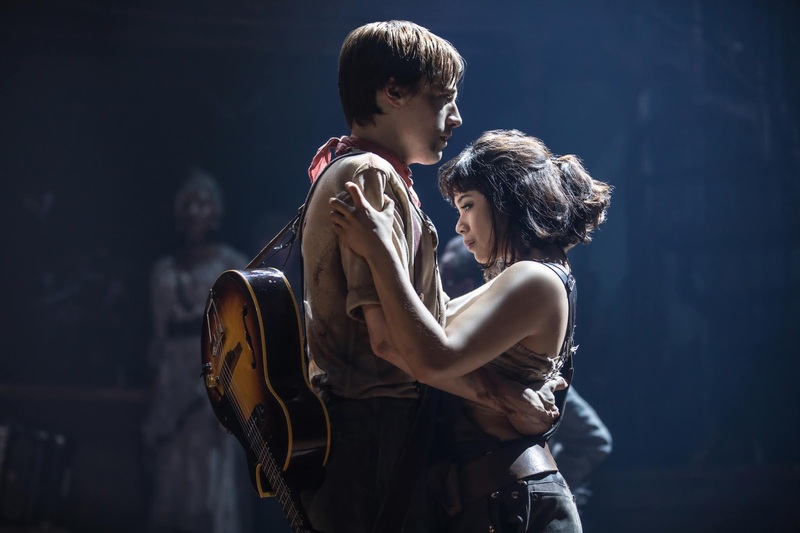 Reeve Carney, Eve Noblezada. Photo: Matthew Murphy. Hadestown’s existence is intentionally ambiguous; the citizenry is composed of slave-like laborers in leather workers’ gear, moving in rhythmically robotic fashion, like figures in an old Soviet Expressionist movie. Everyone seems dead and everything’s symbolic, not to be taken literally, but freedom is clearly a dream the workers’ share. Hades’ wife, Persephone (Amber Gray, as before, sassily sensational and a sure bet for an award nomination), represents the seasons; she’s something of a snow bird, living half the year above ground, half under. Amber Gray, Patrick Page, Reeve Carney. Photo: Matthew Murphy. 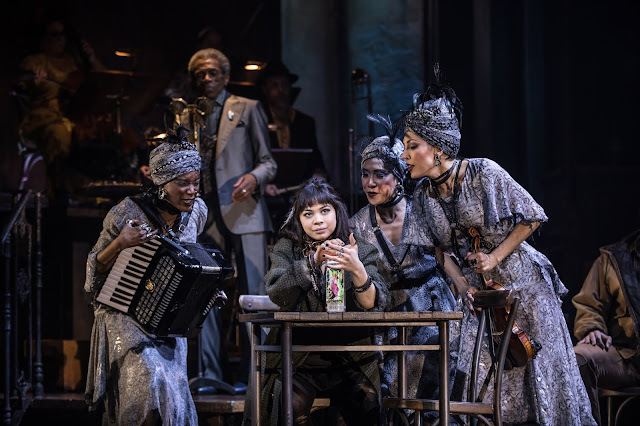 Eve Noblezada and the company of Hadestown. Photo: Matthew Murphy. 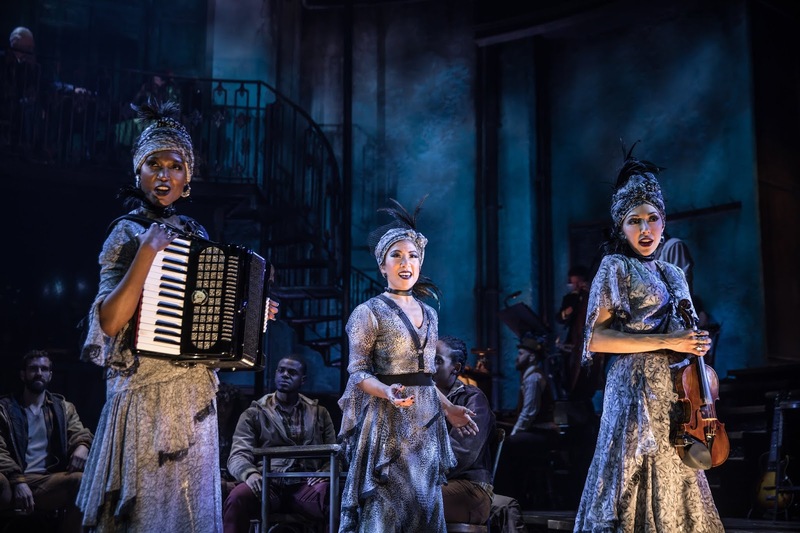 The Fates, a trio of gorgeous women garbed in gray and silver turbans and dresses suggesting Roaring 20s Creole-style flappers, comment on everything in perfect harmony, sometimes playing instruments. The main narrative functions fall to the slick-as-ice, slim-as-a-whip Hermes, decked out in a jazzy, vested, silver suit, with what resemble flaring feathers at his cuffs. 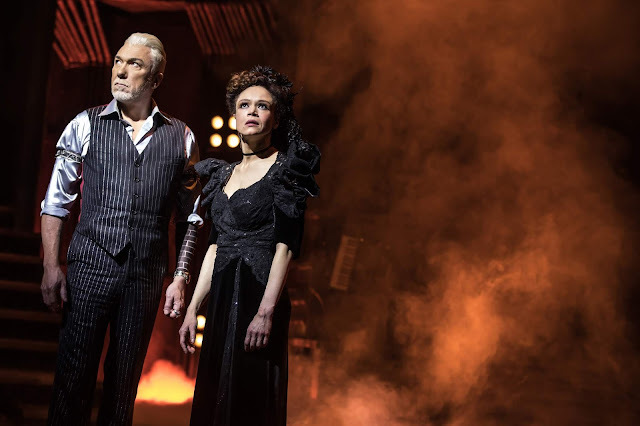 Patrick Page, Amber Gray. Photo: Matthew Murphy. Some of Michael Krass’s masterful costumes are reminiscent of their Off-Broadway predecessors, others are totally reimagined. Orpheus, for example, originally dressed in James Dean-like jeans, t-shirt, and red windbreaker, now wears old sweatpants, a white t-shirt, and a red bandanna. Persephone, though, still brings Billie Holiday to mind in her pale-green, floral-print dress and occasionally-worn hair ornament. Amber Gray. Photo: Matthew Murphy. 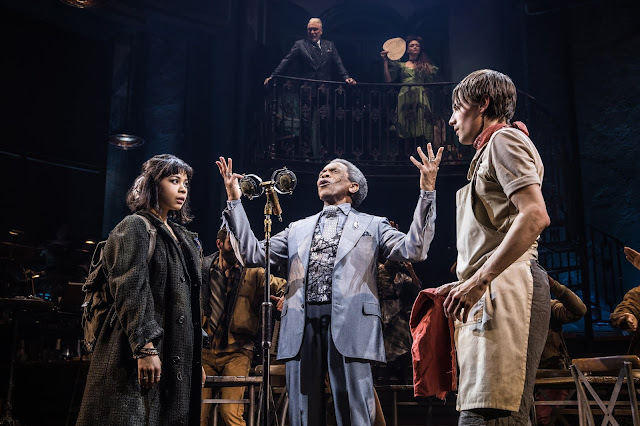 Hadestown, with its extensive use of old-fashioned-looking mics, and even a section where Persephone introduces each orchestra member for applause, is not that far from being a brilliantly-staged concert. But it now seems far more dramatically fleshed out than I remember, and many will be emotionally moved by its tragic story. 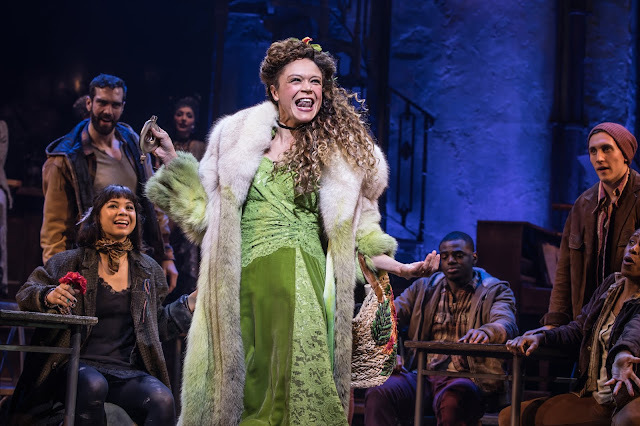 Judging by the unanimous standing ovation that greeted its conclusion (wait for Persephone’s uplifting curtain-call song, "I Raise My Cup"), there are going to be hot times in old Hadestown for many nights to come. "Over the Mountains, Across the Sea"
Nowadays, the word “border” is so fraught that seeing it in a play title instantly sets up expectations. To what borders might it be referring? National ones, political ones, social ones, economic ones, sexual ones? 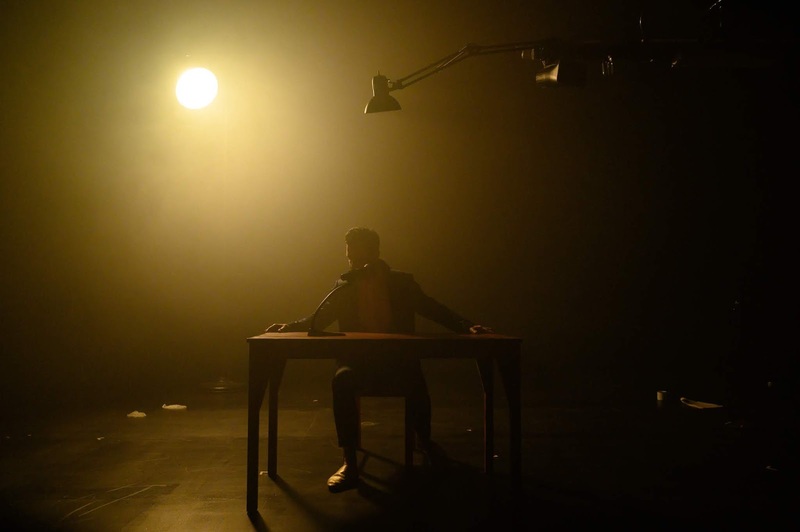 Whatever they are, it’s easy to imagine that a play called 17 Border Crossings will be provocative. 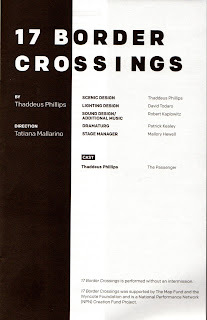 Disappointingly, Thaddeus Phillips’s one-man play of that name, while fitfully amusing, is a trip of a different color. Thaddeus Phillips. Photo: Johanna Austin. 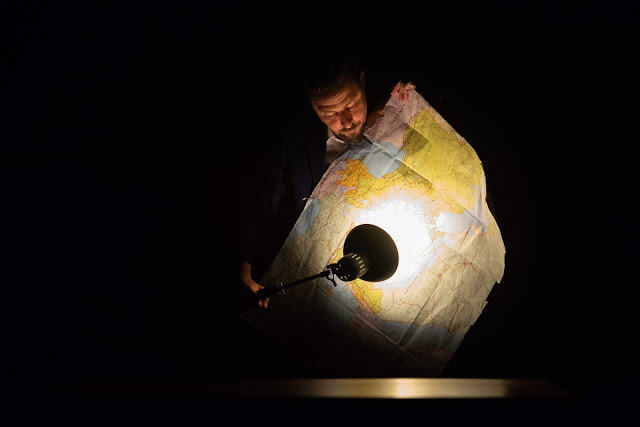 17 Border Crossings (seen at BAM in 2015) is a non-chronological Cook’s tour of Phillips’s world travels, satirizing his experiences in crossing 17 borders from one nation to another over the course of nearly 30 years. The earliest is 1991, when he went from Holland to France via Belgium by autobus. The two latest are from 2018, both involving Mexico and the U.S.A., one journey made by K-Mart plastic raft, the other by bridge. His trips also include crossings between Morocco and Columbia; Israel and Jordan; Israel and Croatia; Egypt and Gaza; Canada and Cuba; Singapore and Bali; and a number of other locations, mostly off the beaten path. 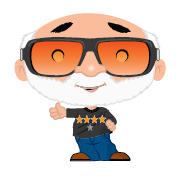 After beginning with a lighthearted history of passports, prefaced by the “St. 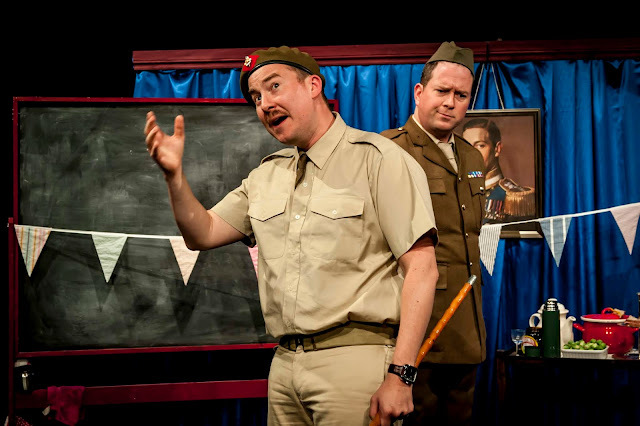 Crispin’s Day” speech from Henry V (Henry is credited with inventing the modern passport), Phillips crosses the dramatic terrain into comical recollections of what, in retrospect, were likely Kafaesque situations with incompetent, frequently officious customs personnel. Here and there, he also provides colorful, tongue-in-cheekish historical or cultural commentary. 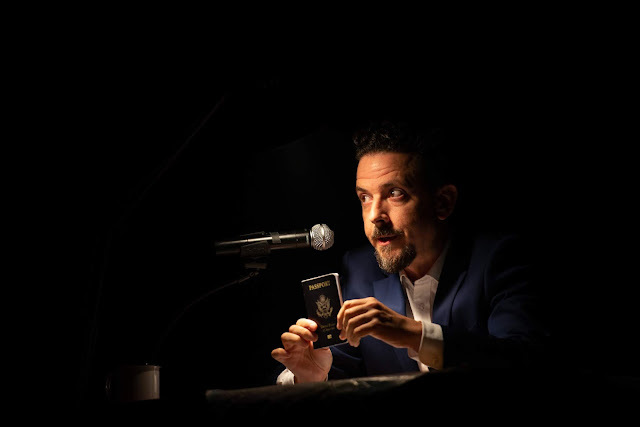 Anyone who’s traveled internationally knows how it feels to go through the process, smiling nervously when showing one’s passport to officials, American or otherwise, regardless of being innocent of malfeasance. In one incident, in fact, Phillips recalls being pulled aside by a U.S. Customs agent at Newark’s Liberty Airport. When Phillips asked what he could do to avoid something similar in the future, the answer was: Just don’t travel. 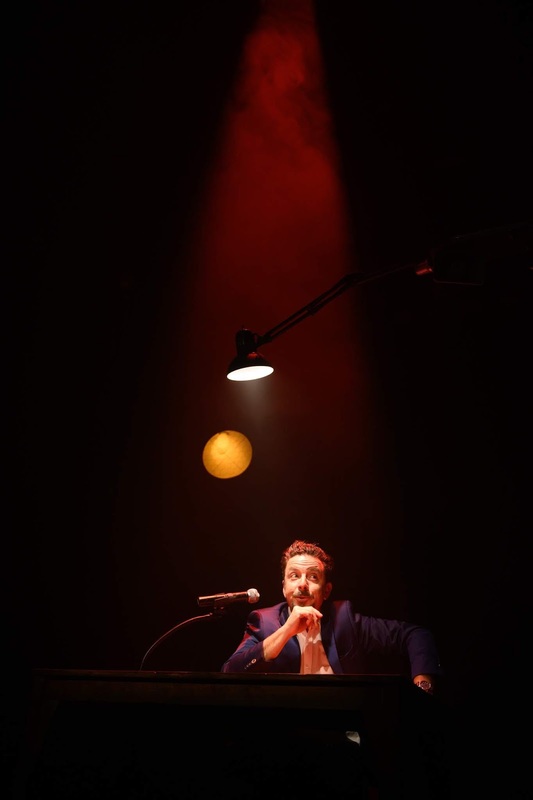 There aren’t as many laughs as one could wish but Phillips, a genial, goateed fellow in his 40s, in a tieless white shirt and blue blazer, with cream-colored slippers, is an ingratiating raconteur. His bag of tricks involves using foreign accents and even bursting into the language of the officials, whose speech he replicates (whether authentically or in well-observed gibberish is sometimes hard to tell). 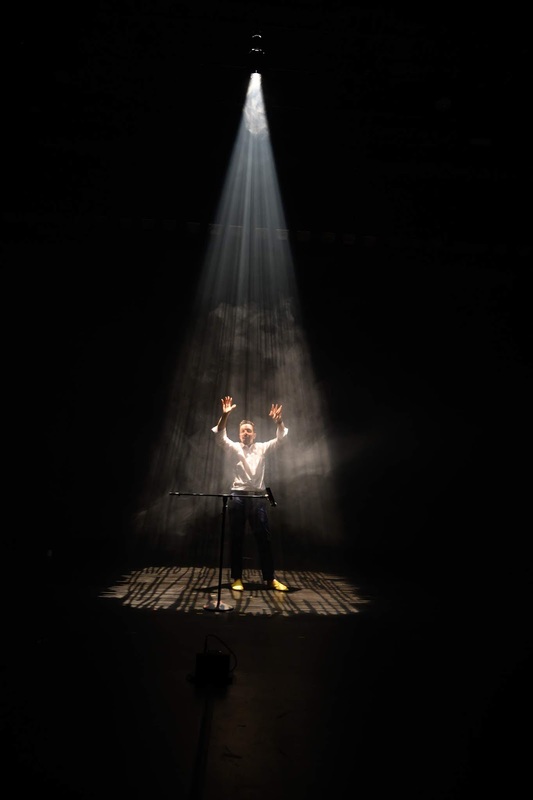 He works on a mostly bare stage that he designed, with a coffee cup, a lamp, a desk, a chair, a mic, and lighting bar that descends when needed. A huge boost is provided by Tatiana Mallarino’s very clever staging, which has him pop up all over the space; David Todaro’s surprisingly complex lighting, always ready with a pin spot where Phillips chooses to stick his head; and the deft sound design of Robert Kaplowitz, which allows the mic to be used both for general amplification and for that loud but intimate sound you get from putting your mouth near metal. Having done the Israel-Jordan crossing myself only a few months ago, its description was of particular interest. The foolishness Phillips encountered was not quite the same foolishness as what I went through but it was close enough. I’d touch on a few other of his other memorable happenstances but no script was available for review and the auditorium was so dark my notes came out looking like ancient Persian (which, unfortunately, I don’t read). 17 Border Crossings, overlong at an hour and a half, never crosses the border into direct commentary about any specific migratory crisis, neither our current one with Central America, nor those plaguing Europe and the Middle East, nor any in Africa or Asia. 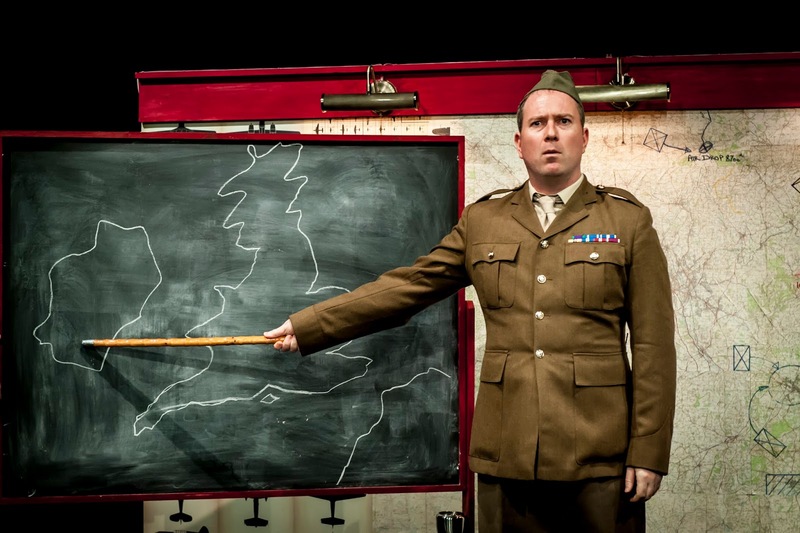 You can, if you must, assume that its message is allusive but its hard to see it as much more than an intermittently funny satire on the complexities of crossing from one territorial domain to another.